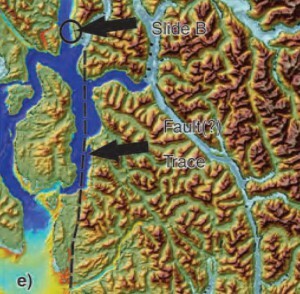 Studies of the October 2012 magnitude 7.8 Haida Gwaii earthquake show that the region is vulnerable to a “major megathrust” earthquake along a newly confirmed fault line west of the islands. That earthquake was felt in Kitimat and Kitamaat Village and a tsunami warning was issued within a few minutes. So have the District of Kitimat, the Haisla Nation Council or Rio Tinto Alcan changed or upgrading their earthquake and tsunami plans in the past couple of years? 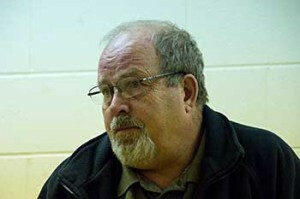 Bob McLeod, who recently retired as the District of Kitimat’s emergency coordinator, told Northwest Coast Energy News: “I think we’ve done quite a bit. One of the biggest issues in the first one was trying to get information out. We’ve come a long way on that. Whether you reach everyone or not, that’s another thing, because you never reach everybody. One of the critical things to me is getting the information out so you avoid all this Facebook, Twitter speculating and rumour. The communications aspect has improved a hundred fold. “We did more work on the mapping and planning. Over the course of the last year, there were a lot of meetings with industry and various stakeholders, discussing emergency preparedness in general but touching on some of these other things as well. “One of the things we did was to try to set up some shelter points. We have an agreement with the Baptist Church, the Catholic Church and the Seventh Day Adventists. They’re strategically located and could be gathering points for the various neighborhoods if necessary. 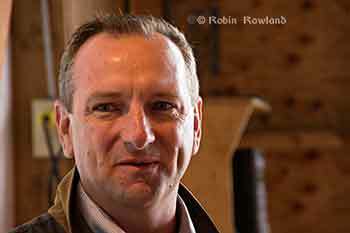 “We’ve also done quite a lot of work on Riverlodge as a group lodging centre, thinking in terms of an earthquake where there may be damage and you have to move people. “We did look at the evacuation planning and we’ve had a couple of exercises involving that, looking strategically about how can you move people from certain neighborhoods, asking which neighborhoods would be at the most risk if you ended up with a tsunami situation. As for tsunamis, McLeod said, “From everything we’ve heard and been told, tsunamis in extremely deep water like that is not going to be as dangerous as one in shallower water, but the possibility is still there. “The thrusts are the killers when it comes to tsunamis, but there is a very good warning system on the tsunamis. We do get very very rapid feedback on the earthquakes. “The only danger in that regard is if you have a severe earthquake and you have part of a mountain drop into the salt chuck, you’re going to get a massive wave and you’re going to get no warning whatsoever, like the Moon Bay collapse in the seventies. “The emergency plan is in good shape. We scheduled a number of exercises last year through training programs. Last week, Northwest Coast Energy News asked Rio Tinto Alcan and the Haisla Nation Council if either could comment on updated earthquake or tsunami response plans. So we have received no answers. Climate change, which will raise ocean temperatures and more carbon dioxide in the atmosphere which will increase the acidification of the oceans will have the greatest affect on the intertidal zones—and a key indicator species, crabs and similar creatures. The study by co-author Jonathan Stillman and his colleagues, is the first to explore intertidal zone organisms’ response to combined variation in temperature and pH, which is expected to intensify in the future due to climate change and ocean acidification. The current and previous studies have shown that during low tide, air temperatures in the intertidal zone can fluctuate dramatically as much as 20 degrees celcius over short periods of time up to six hours. Temperatures can reach extremes when low tides coincide with hot days. Marine intertidal organisms tolerate these natural temperature fluctuations, yet it is known that they are limited in their scope to tolerate future warming. In the simulation porcelain crabs were placed in a specially built aquarium designed to simulate the natural environment, including tidal changes. At low tide, with the crabs exposed to the air, the researchers varied the temperature to mirror day-to-day changes the crabs currently experience — such as cooler air on a cloudy day and warmer air on a sunny day — as well as conditions expected in the future. At high tide, with the crabs submerged, they adjusted pH levels in the same fashion. As the temperature rose and pH levels dropped — conditions expected in the future due to climate change — the crabs’ ability to withstand heat increased. But at the same time, researchers found, the crabs’ metabolism decreased. In addition, the combined effect of higher temperatures and lower pH levels was greater than the effect of either of those two factors alone. 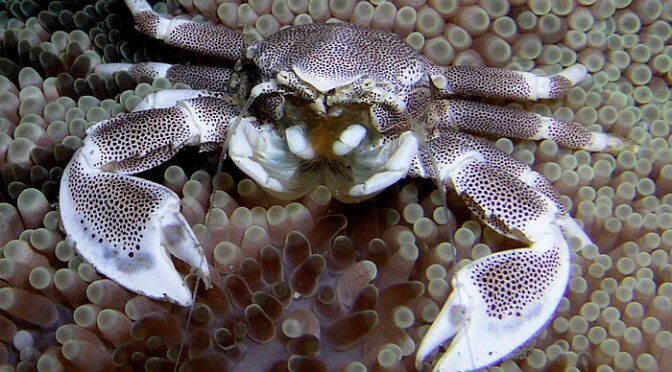 The study says that although porcelain crabs are not particularly important to humans — they are not fishery crabs such as Dungeness — they are an important food source for coastal fish, birds and other crabs. 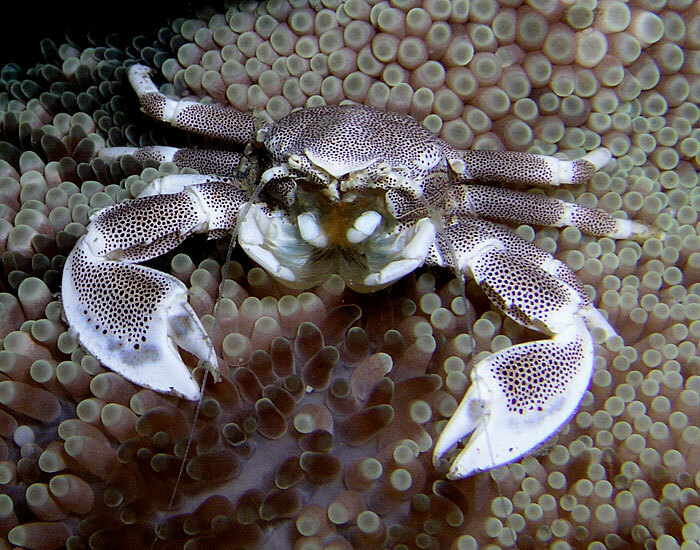 The porcelain crabs can also be seen as a model for scientists to understand the impacts of climate change and ocean acidification on crustaceans in general, Stillman said. Future studies will look at the impact of varying temperature and pH changes on different species of porcelain crabs, juvenile crabs and crab embryos. District of Kitimat Council has urged residents to turn out in large numbers for consideration of the North Coast Draft Marine Plan at the Kitimat Valley Institute Tuesday, May 13, from 5:30 to 8:30. In introducing the motion, Mayor Joanne Monaghan said she was worried that not enough Kitimatians, especially charter operators, boaters and fishers were aware of the meeting. Residents can download the plan from the Mappocean website at http://mappocean.org/north-coast/draft-plan-for-input/. MAPP stands for Marine Planning Partnership for the North Pacific Ocean. The parners include the province and the Skeena First Nations Stewardship Society (NCSFNSS), representing the Metlakatla, Kitsumkalum, Kitselas, Haisla, Gitga’at, and Gitxaala Nations. that is indented with deep fjords and dotted with thousands of islands. It is a region of profound beauty, significant ecological diversity and remarkable cultural richness. Prince Rupert, Terrace and Kitimat are the largest communities in the North Coast plan area, which supports an overall population of approximately 42,000. The physical complexity of the North Coast includes a range of ecosystem types, including important estuaries that support distinct marine ecosystems and species. A diverse range of economic and community activities occur within the North Coast plan area. Commercial fisheries and associated processing facilities and logging have supported communities along the coast since the early 1900s. These activities continue to be important to the well-­‐being of coastal communities. Port activities centered around the communities of Prince Rupert, Kitimat and Stewart, and active recreational fishing and tourism sectors, continue to be strong economic drivers in the area. North Coast First Nations living in the region have distinct cultural and spiritual heritages that are intricately linked to the marine environment and the long-­‐standing sustainable use and management of marine resources. The plan appears to overlap some areas where there have been environmental assessments of the Northern Gateway and the numerous liquified natural gas proposals. The draft plan brings together science and Aboriginal knowledge, input from the technical staff of NCSFNSS (representing the Gitga’at, Gitxaała, Metlakatla, Kitsumkalum, Kitselas and Haisla Nations) and the Province. Key information and direction was provided by First Nations strategic marine use plans and existing provincial planning and policy documents. Ecological, cultural and social and economic data sources were compiled and analysed by the joint technical team and contract support. 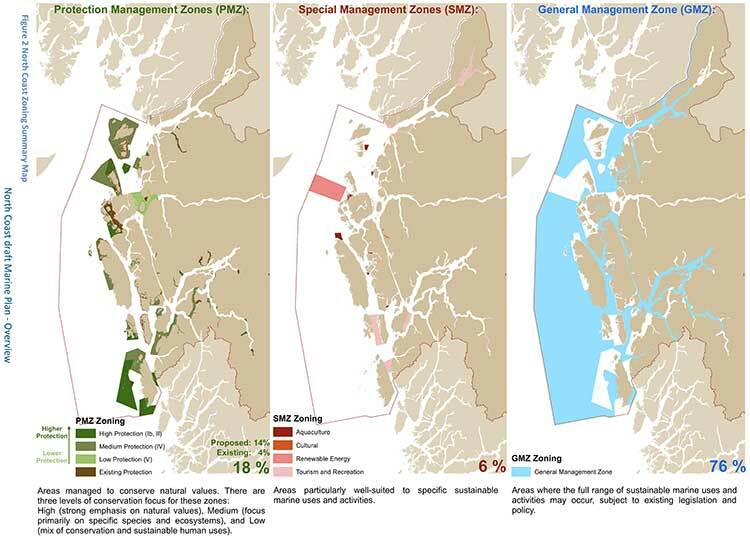 Relevant background scientific reports and technical documents from the Pacific North Coast Integrated Management Area (PNCIMA) process were also used, along with the BC Marine Conservation Analysis. Additional information was drawn from government reports and publications, academic literature, industry or sector publications, discussions with experts and local knowledge. Advice was also incorporated from the North Coast Marine Plan Advisory Committee and public and stakeholder engagement. The Pacific North Coast Integrated Management Area process was killed by the Harper government in the fall of 2011 . The decision to kill the PNCIMA was officially for budget reasons, but general speculation at the time was that Harper and then Natural Resources Minister Joe Oliver wanted to kill PNCIMA as one way of ensuring the government could push through the Northern Gateway project. The MAPP program was set up by the province and First Nations as a reaction to Harper’s decision. If there is a significant flaw in the Joint Review Panel report on Northern Gateway, it can be found in the panel’s analysis of Enbridge Northern Gateway’s plans to blast and dredge at the proposed Kitimat terminal site. While the Joint Review Panel does consider what it calls “cumulative effects,” the panel plays down those effects and offers no specifics about interaction between the Northern Gateway project and the two liquified natural gas projects, the KM LNG project at Bish Cove and the BC LNG floating terminal at the old log dump. It appears the JRP considered the legacy effects of the Rio Tinto Alcan smelter and other Kitimat industries while not taking into consideration future development. The dredging and blasting planned by Northern Gateway, as Enbridge said in its evidence, appears to have only a minimal effect on Douglas Channel. A glance at the map in the Joint Review ruling shows that that the dredging and blasting site is directly opposite Clio Bay, where Chevron, in partnership with the Haisla Nation, plan a remediation project using marine clay from the Bish Cove construction site to cap decades of sunken and rotting logs. The Clio Bay project was not part of the evidence before the Joint Review Panel, the plans for the project were not formulated until well after the time for evidence before the JRP closed. But those deadlines show one area where the rules of evidence and procedure fail the people of northwestern BC. The JRP is a snapshot in time and changes in the dynamics of the industrial development in the Kitimat Arm are not really considered beyond the terms of reference for the JRP. It appears from the report that Enbridge plans to simply allow sediment from the blasting and dredging to float down Douglas Channel, dispersed by the currents and the outflow from the Kitimat River. Northern Gateway said that dredging and blasting for marine terminal construction would result in a sediment plume that would extend over an area of 70,000 square metres for the duration of blasting activities. Approximately 400 square metres of the assessed area of the marine terminal is expected to receive more than 1 centimetre of sediment deposition due to dredging. Outside of this area, typical sediment deposition levels alongshore where sediment is widely dispersed (a band approximately 4 kilometres long and 400 metres wide) are very low; in the range of 0.001 to 0.1 centimetres. Dredging and blasting activities are expected to occur over a period of approximately 18 weeks. Northern Gateway expected most of the sediment plume created by construction activities to be minor in relation to natural background levels. Northern Gateway would use bubble curtains to reduce pressure and acoustic effects of blasting, and silt curtains to reduce the effect of sedimentation from dredging. It said that bubble curtains are used extensively for other activities, such as pile driving, to reduce the effect of high pressure pulses that can cause injury to fish. It added that bubble curtains have been tested extensively with blasts, and literature shows they are effective. re-suspended by project construction activities, such as dredging and blasting, and as a result ofstorm events, tides, and currents. 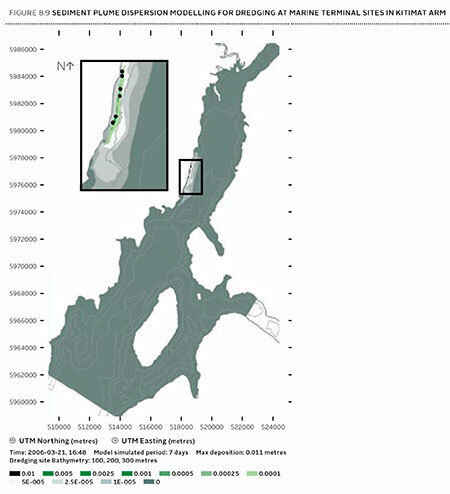 Northern Gateway’s sediment and circulation model and its evidence related to contaminated sediment re-suspension at the terminal site. Both parties said that the sediment model was applied for the spring, when the increase in total suspended solids would be negligible compared to background values. In the event of delays, blasting and dredging would likely occur at other times of the year when effects would likely be higher, and these scenarios were not modelled. Species diversity within Kitimat Arm’s rocky intertidal community is generally low. Barnacles, mussels, periwinkles, and limpets can be found on rocky substrate. Sea urchins, moon snails, sea anemones, sea stars, and sea cucumbers are in shallow subtidal areas. Sandy areas are inhabited by commercially-harvested bivalves such as butter clams and cockles. Northern Gateway said that construction, operations, and decommissioning of the marine terminal would result in both permanent and temporary alteration of marine fish habitat. Dredging and blasting, and installing physical structures in the water column for the marine terminal would permanently alter marine fish habitat. Based on the current terminal design, in-water site preparation would result in the physical alteration of approximately 1.6 hectares of subtidal marine habitat and 0.38 hectares of intertidal marine habitat. Northern Gateway expected approximately 353 square metres of subtidal marine habitat and 29 square metres of intertidal habitat to be permanently lost.This habitat would be compensated for by marine habitat offsets. The project’s in-water vertical structures that would support the mooring and berthing structures could create new habitat, offsetting potential adverse effects. The structures may act as artificial reefs, providing marine fish habitat, food, and protection from predation. Although organisms currently inhabiting the work area would be killed, the exposed bedrock would be available for colonization as soon as the physical works are completed. In its finding on marine sediment, the panel, as it does throughout the ruling, believes that the disruption to the environment caused by previous and ongoing human activity, means that the Northern Gateway Kitimat terminal won’t make that much difference. include effluent from a municipal wastewater treatment plant, the Alcan smelter, Methanex Corporation’s methanol plant, and the Eurocan pulpmill, as well as storm water runoff from these operations and the municipality. Area is largely controlled by natural outflow from the Kitimat River with suspended sediment levels being highest during peak river runoff (May to July, and October) and lowest during winter. Storm events, tides, and currents can also suspend sediments. Levels of total suspended solids fluctuate seasonally and in response to climatic variations, but are generally highest during the summer. Commercial and recreational vessels currently operating in the area may increase suspended solids by creating water turbulence that disturbs sediments. Given the current sediment contamination levels and the limited area over which sedimentation from construction activities would be expected to disperse, the Panel finds that the risk posed by disturbed contaminated sediment is low. Northern Gateway has committed to monitoring during construction to verify the predicted effects on sediment and water quality for both contaminants and total suspended solids.. The dredging and blasting section of the Joint Review Report is small when compared to the much more extensive sections on pipeline construction and tanker traffic, and the possible effects of a catastrophic oil spill. Although minor, the marine sediment section exposes the question that was never asked, given the disruptions from years of log dumping at Clio Bay and Minette Bay and the decades of developments at the mouth of the Kitimat River, and future development from LNG, when do cumulative effects begin to overwhelm? How much is enough? How much is too much? If every project continues to be viewed in isolation, what will be left when every project is up and running? Chevron, the company operating the KM LNG project at Bish Cove and the Haisla Nation have proposed that marine clay from the Bish Cove construction site be used to cap more than 10,000 sunken and rotting logs in Clio Bay. Haisla Chief Counsellor Ellis Ross says he hopes that using clay to cover the logs will help remediate the environmentally degrading sections of the Bay. The proposal has brought heated controversy over the plan, both among residents of Kitimat and some members of the Haisla Nation, who say that Clio Bay is full of life and that the capping will cause irreparable damage. An investigation by Northwest Coast Energy News shows that capping thousands of sunken logs is a lot more complicated and possibly costly than anyone has considered. It is also clear that many of the comments both supporting and opposing the Clio Bay project are based on guesses rather than the extensive scientific literature available on the subject. In 1997, the Department of Fisheries and Oceans surveyed sunken log sites in Douglas Channel. The results, published in 2000, identified 52 sites just on Douglas Channel and the Gardner Canal that had various levels of enviromental degradation due to sunken logs. Clio Bay was not the list. The DFO scientists recomended followup studies that never happened. Scientific studies show that degradation from sunken logs can vary greatly, even within one body of water, due to depth, currents, number of logs, and other factors. So one part of a bay can be vibrant and another part environmentally degraded due to low levels of dissolved oxygen and decaying organic material. If KM LNG wasn’t paying for the remediation of Clio Bay, it could be very expensive. Capping sunken logs at a cove near Ketchikan, Alaska, that is the same size and shape as Clio Bay cost the US and Alaska governments and the companies involved $2,563,506 in 2000 US dollars. 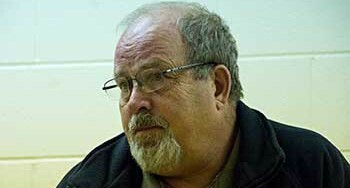 The total cost of the cleanup of the site which was also contaminated with pulp mill effluent was $3,964,000. The estimated cost of capping the logs in the Alaska project was $110 per cubic yard. The Alaska project shows that a remediation project means while most of the logs in a bay or cove can be capped, in some parts of a water body, depending on currents, contamination and planned future use, the logs have to be removed and the area dredged. Agencies such as the State of Alaska, the US Environmental Protection Agency and the US Army Corps of Engineers all recommend using “clean sand” for capping operations. Although “clay balls” have been used for capping in some cases, the US officials contacted say they had no record of large amounts of marine clay ever being used for capping. They also noted that every log capping project they were aware of happened in sites that had other forms of contamination such as pulp mill effluent. Chevron only recently retained the environmental consulting firm Stantec to study Clio Bay. The Department of Fisheries and Oceans has told District of Kitimat Council it recently completed mapping of the seafloor at Clio Bay. The Alaska project was preceded by five years of monitoring and studies before capping and cleanup began. A letter from Fisheries and Oceans to the District of Kitimat says that Clio Bay has been mapped and the department is planning to monitor any capping operations. However, it appears from the Department of Fisheries and Oceans website that the department has no current policies on remediation since the Conservative government passed two omnibus which weakened the country’s environmental laws. According to the website, new remediation policies are now being drafted. That means that although DFO will be monitoring the Clio Bay operation, it is uncertain what standards DFO will be using to supervise whatever happens in Clio Bay. Northwest Coast Energy News is continuing its investigation of the sunken logs problem. Expect more stories in the days to come. Clio Bay: What happens to sunken logs? The forest industry has been operating on the Pacific coast from Oregon to Alaska for more than a century. Over that time, it is likely that millions of logs from booms and other operations have sunk to the bottom of bays, cove, estuaries and inlets along the coast. During that century, scientists in both Canada and the United States have been studying the effects of the those sunken logs on the sea bottom. It is only in recent years that the cumulative effect of all those logs has become an environmental concern. As well as logs on the sea bottom, ranging, depending on location, from a couple of hundred to the tens of thousands of logs, there are wood chips, wood fibre and discarded log parts and bark. Often metal cables, bolts, ropes, and other manufactured material either dropped accidentally or deliberately discarded are also found among the old logs, further contaminating the seabed. Compounding the problem of the sea bottom is organic material that would occur naturally on the seabed, including tree trunks, roots, branches, conifer needles, deciduous leaves and other material from terrestrial plants. Anyone who sails Douglas Channel after a storm can see with all the floating tree trunks in the Channe. That means that storms and spring run off ads debris to the natural pile up of old logs and debris. At logging sites, this natural material, brought in by creeks and rivers, piles up on the already sunken logs. Over the years, depending on the salinity, teredos, more popularly known as ship worms eat the wood, often leaving a tube of bark that eventually collapses. The rotting wood, bark and other material is often, depending on conditions, pounded into fragments by the action of waves, currents and outflow from rivers. Some species of teredo can live in brackish water, but since teredos are not a fresh water species, that means that logs in fresh or mostly fresh water last longer. very few comprehensive, quantitative field studies describing the effects of wood and bark have been published and those that did focused on log handling and storage sites which handled high volumes of more than one million cubic metres. The DFO report said that thick bark and wood debris deposits resulting from log handling can cause substantial, long-term negative impacts to benthic (sea bottom) ecosystems. Under the worst conditions, the cumulative debris can deprive an area of oxygen and, according to DFO, “virtually eliminate aerobic” sea bottom animal life. Studying the problem has been a low priority for DFO and other agencies and that meant a limited budget and few studies. Other problems is that, according to the DFO, parts of BC fjords are steep and “much of the likely impacted habitat is beyond diver range.” There is also pressure to study the effect on “economically or socially important species.” Although the use of remotely operated vehicles has increased since the 2000 report, using an ROV can also be a budget buster for a low priority project. One of the reasons for the disagreements over Clio Bay is that while some people call it “dead” saying there are no halibut and fewer cod, others say that Clio Bay is very much alive, pointing out that it is easy to catch crab and rock cod. The studies that have looked at life on the bottom of log dumps sites have shown that it can be highly variable even within one bay or cove, with many factors creating small local ecosystems, including depth, nature of the sea bottom, for example sand, mud, clay or a mixture, whether or not the sea bottom sediment is “enriched,” the flow of currents, fresh water flow into the site, the percentage of wood on the bottom, the percentage of bark on the bottom, whether the wood and/or bark debris is “continuous’ or “discontinuous,” whether or not the seabed is contaminated as was the case with the cleanup of pulp mill sites at Ward Cove and Sitka, Alaska. In other words, those say Clio Bay is in danger and those who say Clio Bay is a rich source of life are likely both right. For example, while Chris Picard’s (then with the University of Victoria, now with the Gitga’at First Nation) study of Clio Bay said: “Dungeness crabs were observed five times more often in the unimpacted Eagle Bay than in Clio Bay,” and tied that to log dumping and low oxygen. Several people have pointed out that since Clio Bay is one of the closest crabbing spots to both Kitimat and Kitamaat Village, while Eagle Bay is further down Douglas Channel, overfishing at Clio may be a factor in the reported species decline. The dumping of logs into water down skids can result in the generation of a considerable amount of bark and wood debris. The abrasive action of boom boats and waves during the sorting and storage of bundles can also generate quantities of wood debris. Bark and wood lost during dumping often forms thick, continuous, anoxic fibre mats extended from the base of the dump skids. The debris mat tends to dissipate with distance from the entry point; however, wood debris can often be observed substantial.” distances from the dump skids as seen at all four of the sites sampled. Debris deposits can also be generated as logs resting on the sea floor decay. Wood boring organisms (e.g., Toredo) quickly reduce the wood fibre content of logs, but the bark of some species (e.g., western red cedar (Thuja plicata) which has a high lignin content) is left relatively untouched. The amount of wood debris generated during handling and storage can be different depending on tree species, tidal levels, and dumping methods. Debris accumulation, distribution, and the resulting biological impacts are affected by physical factors including depth, sea floor slope, dump site aspect, water currents, and wind or wave exposure. One of the main problems with log dumping is that it has the potential to deplete vital oxygen, especially at deeper levels. Seasonal variations can mean that, even if there are thousands of logs at the bottom, the levels of dissolved oxygen can vary. Years of studies at the cleanup site at Ward Cove, Alaska showed how the oxygen levels can vary by season. In Minette Bay, near Kitimat, a DFO study showed that the Minette is somewhat stagnant and therefore has naturally occurring low oxygen levels, but also that the low levels usually last from May to November and are worst in July. The DFO study went on to say that oxygen poor thick anoxic bark or wood fibre deposits are likely to cause damage to bottom dwelling species, although in the short term, logs may not cause any impacts. It says that some studies have indicated that large pieces of wood debris can, for a time, increase diversity by providing suitable base for some filter feeders as well as food and cover for epifauna and wood boring organisms. Several species not normally found in sand-bed have occasionally been found in log and rock debris. In the long term, logs do decay and the wood and bark left behind can contribute to the wood debris accumulation. One study cited by the DFO survey of Douglas Channel found found that crabs avoided bark deposits when given a choice but when they were forced to live among bark deposits, they were had fewer offspring, had lower feeding rates, and had a decreased survivorship. One theory is that the decaying organic material produces hydrogen sulphide in combination with ammonia and other unmeasured toxicants. One study of Dungeness crabs, living at a log dump in southeast Alaska with elevated hydrogen sulphide and ammonia concentrations in the bark debris, shows the colony had less than half as many reproducing females as a control population. The EPA and Alaska reports from Ward Cove show that sand capping does help restore the seabed environment. Seaspan ULC, the large BC-based marine transportation and shipbuilding company is keeping its on eye on future opportunities in Kitimat and along Douglas Channel, chief executive officer Jonathan Whitworth said Tuesday. Whitworth was in Kitimat to meet members of the Royal Canadian Marine Search and Rescue Unit 63, which operates from the Nechako Dock. 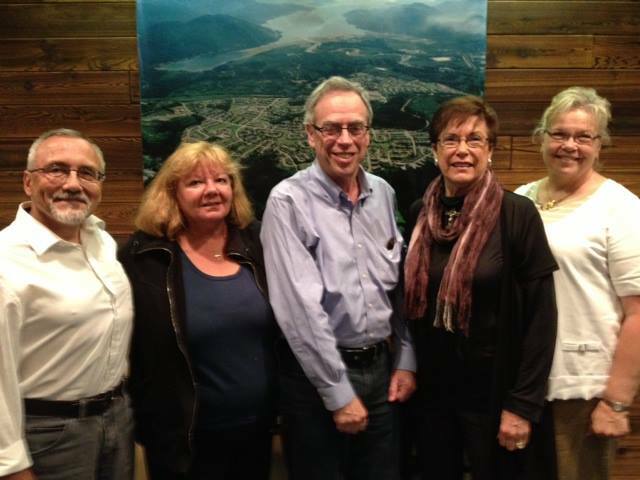 He also met with members of the Haisla Nation while he was in town. Kitimat SAR 63 is one of six stations which will receive $8,500 a year for three years, to help cover operating expenses, from the Dennis and Phyllis Washington Foundation, based in Missoula, MT. Seaspan is part of the Washington group of companies, that has holdings on the west coast of Canada and the United States, owned principally by Dennis Washington. At the moment, Whitworth said, Seaspan operates the HaiSea in partnership with the Haisla Nation. “It’s a boat that you will see up and down the Channel, she does a lot of work for RTA as well as some of the others, mainly from the construction and the up and coming constrution from the new projects. We take a lot of time and effor to make sure our equipment looks good as well as operates well. That’s the kind of pride our crew puts in the vessels and the company supports.” he said. Seaspan barges are also used for the construction projects currently under way in Kitimat. Seaspan has always had a close relationship with the Canadian Coast Guard, Whitworth said and that relationship is even closer now that the Seaspan’s Vancouver Shipyards, was chosen by the federal government for the National Shipbuilding Procurement Strategy for non combat vessels. In February, the federal government announced (pdf) a series of preliminary contracts valued at a total of $15.7 million for the joint support ships, the CCGS John G. Diefenbaker polar icebreaker and the offshore fisheries science vessels. The Washington Foundation is giving a multi-year donation of $1.1 million to three British Columbia marine and port community charitable organizations. Partnering with Sail and Life Training Society (SALTS), Vancouver Maritime Museum (VMM) and Royal Canadian Marine Search & Rescue (RCM-SAR). 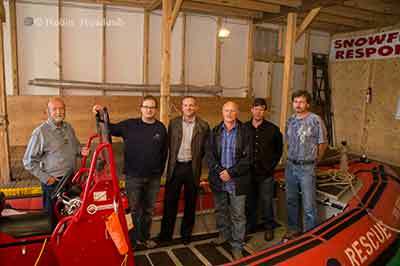 Royal Canadian Marine Search and Rescue received $300,000 over three years. “Half of it $150,000 when to Royal Canadian Marine Search and Rescue Sooke training facility on Vancouver Island, that benefits all of the different stations in BC, they all get a chance to go train and at that training centre,” Whitworth said. “The remaining funds, the $150,000 was spread between six stations that are closely associated with Seaspan, so two in Vancouver harbour, North Vancouver, West Vancouver, two on the Fraser River, one at Delta and one at Richmond, one at Victoria and one right here in Douglas Channel in Kitimat.” The $8,500 covers approximately 35 per cent of the operating costs for Kitimat’s SAR 63 station every year for three years. The Dennis and Phyllis Washington Foundation’s charitable donations are the organization’s first direct donation of their kind in Canada. Since its inception, the Washington Foundation has donated more than $144 million in the United States to hundreds of organizations that focus on education, health and human services, arts and culture, and community service. Mike Halligan, Executive Director of the Washington Foundation, says today’s announcementis the start of an exciting inaugural collaboration with Canadian charitable organizations in British Columbia. Kitimat’s SAR 63 operates along Douglas Channel and down the Inside Passage as far as Butedale. Training takes place every Wednesday evening at the SAR 63 boathouse at the Nechako Dock. The unit will be recruiting new members in September. Anyone interested can contact training officer Duncan Peacock.